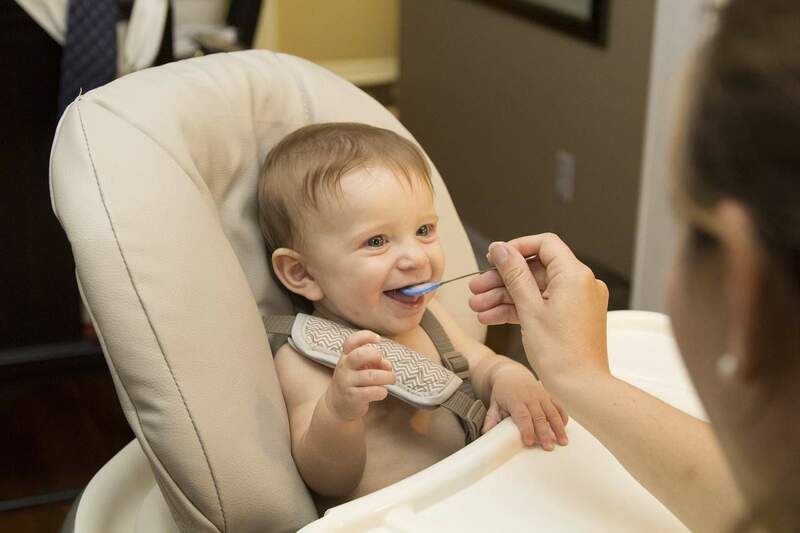 Starting solids is an exciting milestone for babies and parents, however it can also be daunting not knowing where to start or what foods are suitable. Knowing you are feeding your baby all the good stuff is important too, ensuring you are providing wholesome baby food to give them the best start in life. When starting solids, you have the choice of using pre-made baby food products, homemade baby food recipes, or a combination of the two. Back when I was a first time mum, making my own homemade baby food seemed like the perfect solution, both for cost effectiveness and to ensure my baby was getting all natural ingredients without any nasty preservatives or added sugars. We simply needed some home cooked baby recipes to get us started. This was quick and easy, and we were able to freeze bulk lots of baby food in advance, which was also a great way to simplify life. After all, we are big fans of freezer cooking in this household. Fast forward 5 years and we have done majority homemade baby food for both of our two girls when first starting solids, but with the occasional convenience of a premade pouch or jar when travelling or out and about. To create your own homemade baby food at home, you will need a blender or food processor and a way of steaming vegetables before you puree them. We typically use a stove-top steamer which takes about 10-15 minutes depending on the vegetable, and a Baby Bullet blender when we are making our baby food at home. The Baby Bullet is super fast and it comes with the perfect size food pots and containers for different batches. I remember initially most of what we made were the Baby Bullet recipes that came with it, until we decided to experiment with a few interesting baby food recipes of our own. If you are planning to make up bulk lots of food and freeze them, you may also want some extra freezer safe baby food containers. These Mumi&Bubi ones were what we used and they worked perfectly for serving sizes. You can freeze in batches then just pop out the servings you need to defrost and serve to bub. It can be a little daunting at first transitioning your baby to solids, but it doesn’t need to be. 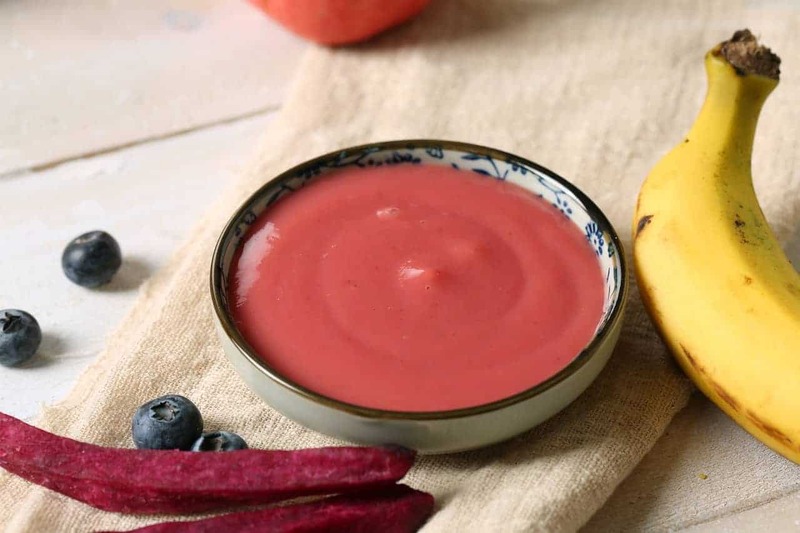 There are so many great baby food recipes out there and we’ve got 10 right here to help you get off to a strong start with homemade baby food recipes. 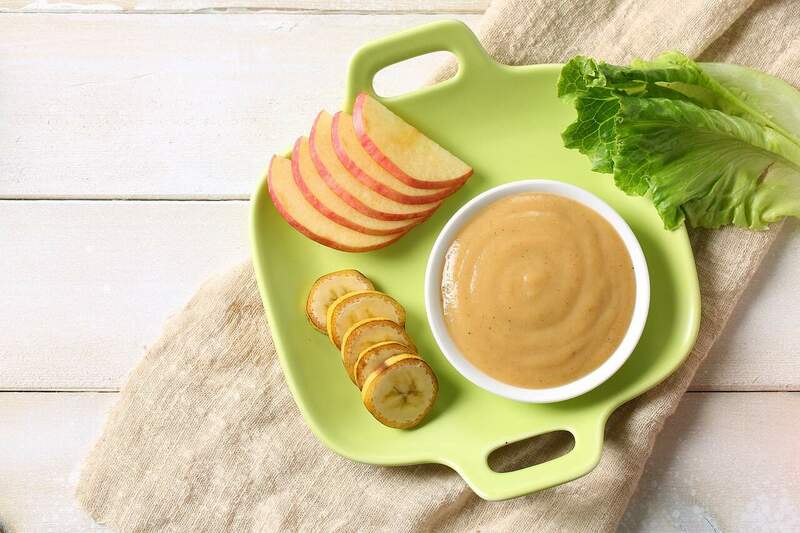 These first few baby puree recipes are perfect for those early days, when you are just starting your baby on solids and they seem ready to roll. Usually this occurs between 4-6 months, but fine to continue beyond this stage as you introduce more foods. These are good flavours to start with your baby food recipes 4 months and beyond. Add ingredients to blender/processor and puree to desired consistency. Boil or steam both potato and apple until very soft. Puree until smooth. Boil or steam carrot and squash until soft. Add to blender/processor and puree to desired consistency. Add rice to food processor and mill to a fine powder. Add rice powder to pot of water and cover until it boils. Turn down heat and cook for further 20 minutes. Once cooled, add cooked rice to blender with banana and kiwi fruit and puree to desired consistency. Steam or boil zucchini and pear until soft. Add to blender/processor and puree to desired consistency. Steam/boil broccoli until soft. Add broccoli and watermelon to bender/processor and puree to desired consistency. These next few recipes are for once your baby has adapted to their early basic solids and you can start introducing more interesting flavours and textures. Depending on your baby’s preferences, you can puree these combos for shorter periods to create soft chunks and thicker textures. At this age you will also want to have some more interesting baby food recipes to keep their tastes growing too. Run oats through a food processor to mill into a finer texture. Add to a pot of water and boil, then turn down and cook for a further 20 minutes. Steam pear until soft. Add oats and pear to blender/processor and puree to desired consistency. Add cooked/steamed ingredients to blender with the water and puree to desired consistency. Pre-cook quinoa and steam cauliflower until soft. Add both to blender/processor with berries and puree to desired consistency. Add ingredients to blender/food processor and puree to desired consistency. A great starting point is introducing these foods separately first to make sure there are no allergic reactions, then start creating some flavour combos with different baby food recipes. If purees are too thick, add more water. Set aside some of the foods you are cooking for the rest of the family for use in baby meals to save time. While making homemade baby food is a wonderful option for meals at home, sometimes you do find yourself time poor and running low on frozen portions. Or perhaps you are out and about for long periods and don’t want to worry about the inconvenience of keeping your homemade baby food refrigerated until you need it. This is where pre-made baby food is actually a great option. Heinz baby food recipes have are loaded with goodness and nutrients that your baby needs and you can purchase their Heinz range at your local supermarket. Check out the Heinz good stuff chart below to learn more about their products and a guide for giving your baby nutritional meal options either homemade or store purchased with Heinz baby recipes. There is no reason why you can’t give your baby a mix of baby food you make and baby food you buy. Just make sure you have a close look at what is going into the foods you are purchasing so you know your baby is still getting great quality ingredients and a variety of nutrients into their diet. However in saying that, here in Australia it is quite strict what is available to purchase in our supermarkets which is a reassuring thing as a new parent, as that baby food aisle can be overwhelming!! But if you do get into the swing of things with making your own baby food, and you start to make your own baby food pouches in bulk, you might as well dig into the next step and start freezer cooking for the whole family! This is one of our biggest time savers, especially back when we had a shift working dad in the household! Bulk freezer cooking means meal prep is done and time is free to spend instead focused on your little ones and their needs! It’s great experimenting with new foods as they get older too, but yes, pouches when out & about any day for us! My first baby I made absolutely everything from scratch, but by the time number 2 came along we were relying on pouches a lot more! Some of the flavour combos sound horrid, but the kiddies seem to like them! Do you know what? I can’t even remember what purees I made Elliott! But these look great. I’ll definitely share. Thanks Eva. There are so many combos I made that I couldn’t remember many of them but I’m sure I will do a follow up with some new combos when Violet is ready for solids. Great recipes! Im bookmarking 🙂 We cant do Kiwi though sadly, my hubby is seevrely allergic and I have a slight allergy… booo…. they are so tasty! I always made my own baby food, because I just liked to know what was in it! Freezing bulk packs is just so easy. This is great! Keeping for future reference. 🙂 Thanks for sharing at Merry Monday, hope to see you again next week! Great recipes you share.All foods are good for babies health.Every parent should make their own baby food for their kids.By preparing your baby’s food yourself, you know exactly what your baby is eating. Thank you very much for sharing this informative article with us.